Nowadays, being a CA is an inspiration for various commerce students but it is a tough course which is easy to enter but difficult to exist. Through the entrance examination, ICAI tests the aptitude level and ability of students to do the course efficiently. CA Foundation is an entrance test which is introduced by ICAI in place of CPT. CPT is an entrance test for the students who want to pursue the Chartered Accountancy course. With effect from 1st July, 2017 ICAI has revised its syllabus and replaced CPT with the CA Foundation. The registration for the CPT has ceased from 30th June 2017 and registration for the CA Foundation has started from 1st July 2017. Exams for the Foundation course held twice in a year May and Nov same as its other levels CA Intermediate and CA Final. You will be eligible to register for this course after appearing in the 12th examinations constituted by Law or conducted by an examining body recognized by the Central Government. Earlier, a student after clearing 10th examination could register himself for CPC (Common Proficiency Course) but now a student only after appearing in class 12th examination can register himself for the CA Foundation. And he will be eligible to sit for the exam only after passing the 12th Examination. A student has to undergo the four months study period for appearing in the CA Foundation Examination. For example, if you want to appear in the MAY 2019 Examination then you need to get yourself register on or before 31st December 2018 and in case if you want to appear in November 2019 Examination then the registration must be completed before 30th June 2019. Your registration will not get end in case you could not pass the Examination in either one or two attempts. The registration for the CA Foundation course will be valid for three years i.e. upto six attempts. Even after three years, you can revalidate your registration for a further three years by depositing Rs 300/- as revalidation fees. 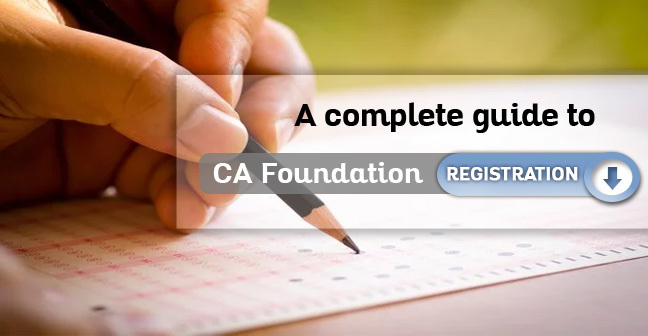 You can get registration in this course by filling CA foundation online application form available on the ICAI website under the course registration form under the student's tab. Thereafter a screen will appear where you will have to register yourself and for registering you have to enter your personal details like your name, contact no., Gender, DOB, E-mail etc. and give password to your account. Once you click on the submit button an OTP will send on your given Email id and Mobile no. This OTP will complete your verification process. As and when your verification is completed your registration will also be completed. Now you can log in to the portal where you will fill your pending details and make the requisite payment through the payment gateway. Attested copy of the Admit Card/ Marksheet of class 12th Examination issued by the respective board. One latest colored photograph should be affixed on the hard copy of the registration form. Attested copy of the proof of Nationality, if the student is a foreigner. Attested copy of the proof of special category certificate i.e. ST/ SC/ OBC or differently abled. Attested copy of the 10th Marksheet/ Admit card of 10th class indicating the Name and Date of Birth. On completion of the registration process, study material will be sent to the students to their registered address through the CDS (Centralised Dispatch System). Registration fees for the CA Foundation course are Rs 9000/- plus Rs 200/- cost of prospectus plus Rs 200/- (optional) for student’s journal. ICAI issues CA Foundation registration letter for the students who have registered for this course. It takes around one month to reach registration letter to reach your address. In case time has passed then you can inquire with the regional office. The candidate has to go on the ICAI official site (www.icai.org), then click on the e-services at the top of the site on the right side. After clicking on the e-services you will found Reprint Letter under the head Members and Students. There you need to select the type of the letter which you want to get print i.e. registration for CA Foundation. After selecting the letter type you need to select the candidate type i.e. student. After that, you have to enter your registration number and thereafter date of birth. After submitting the above details you can get print of your acknowledgment letter. It is always advised by ICAI to bring your CA Foundation registration letter along with the admit card. In the absence of availability of admit card, If a student has a registration letter then he/she can appear in the examination after some procedures. If you lost your registration number, registration letter helps in claiming your registration number. To ensure your CA Foundation registration, you need to check your CA Foundation registration status. By these two methods, check and confirm your registration. At the end of your CA Foundation registration procedure, you receive a confirmation mail including your registration number and password. It confirms your registration. You can also check your CA Foundation registration status here from the above CA Foundation registration letter link. If you can successfully access your registration letter, it confirms your registration. We hope that this article would help you in completing your CA Foundation registration status. So, you are welcome to the Chartered Accountancy course. And if you want to clear the exams smoothly then you need a correct mentor who can guide you in the correct way. VSI teachers have proven great mentors for the number of students. So, we welcome you to the VSI for the CA Foundation. And once you studied with the VSI, you will not go anywhere for the Intermediate and CA Final.